2003 : Installation of an Automatic parboiling Plant for Odourless Parboiled Rice Production. 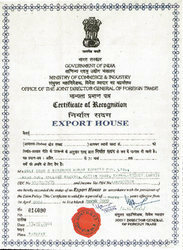 2004 : Reconization of Two Star Export House status by Government of India. 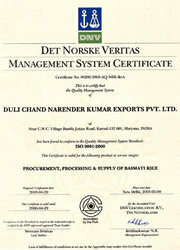 2004 : Launching of Co's rice brands, DUNAR, RANI DANA & EHSAAS in the Domestic Market(s). 2004 : Set up of a modern and fully equipped Paddy & Rice testing Laboratory. 2005 : Opening up a Corporate Office in New Delhi. 2005 : Set of another latest Sortex plant. 2006 : Award of CRISIL SE-1A rating for "Highest Performance Capability and High Financial Strength" by NSIC-CRISIL. 2006 : Installation of another Double Capacity Automatic Parboiling Plant for Odourless Parboiled Rice Production. 2006 : Set up of Co's own Warehousing facilities of 40000 MT capacity. 2007 : Set up of a Fully Intergrated & 100% PLC Controlled Automatic Rice Milling Unit equipped with the very latest technologies. 2008 : 12 TPH fully integrated rice milling, parboiling and processing plant, the very latest from Buhler of Germany. the 1st one of its kind in Asia - by virtue of its having a 'Touch Screen Panel' which is a new invention by the rice milling technologists at Buhler.